Whether you are an employer or an employee, being involved in a Missouri unemployment benefits dispute can be a stressful and complicated matter. For an unemployed worker, successfully obtaining your unemployment benefits can mean the difference between keeping or losing your home, feeding your family, or any being able to afford any other number of important necessities of life. On the other hand, employers have a significant financial incentive to ensure that employees who are not entitled to unemployment benefits do not wrongfully obtain them. Missouri attorney Kenneth P. Carp is a skilled unemployment attorney who has experience handling all aspects of unemployment benefits disputes. To schedule a free consultation with Mr. Carp, call our office today at 636-947-3600. There are many other issues related to unemployment with which Mr. Carp can be of assistance, and both employers and employees with questions should be certain to discuss your situation at no cost to you. Under Missouri law, when a qualified employee loses their job beyond their control, they have the right to unemployment benefits to help them cover their basic needs and expenses while they look for new work. In many cases, these benefits can save individuals and households from financial ruin if they were completely reliant upon the lost income. Unfortunately, many people who deserve and need unemployment benefits can experience wrongful delays or denials of their claims. It is imperative to have representation at every stage of your appeal to ensure you have the best chance of proving your case. Even if the administrative appeal may seem more casual that court cases, it is still an official proceeding and everything you say can be used against you. Having an experienced unemployment attorney on your side can help ensure that you receive the benefits you rightfully deserve. Furthermore, many people who have recently lost their jobs may benefit greatly from consulting with an unemployment attorney during the claim process. Ensuring that your claim is properly completed and filed can reduce the chances of delay or denial and can prevent the need for a subsequent appeal. Missouri law requires that most employers carry unemployment insurance. However, the law does not require that an employer pay out on a false or invalid claim for benefits. Paying benefits can increase your premiums and affect your bottom line, so it is important to realize when a wrongful claim has been filed and know how to argue against it. Inadequate earnings – To be eligible for unemployment benefits, the law in Missouri requires that an employee had earned a certain amount of money from their employment in a designated 12-month period of time, referred to as the “base period.” If an employee has not met the minimum earnings, they should not receive benefits. The employee voluntarily left the position – If an employee quits their job, they generally should not qualify for unemployment. Some employees may try to claim constructive discharge due to harassment and you should be prepared to contest these claims when needed. You fired the employee for misconduct – Employees often try to argue that their behavior did not rise to the level of “misconduct” under Missouri law. These definitions have recently changed in our state and it is imperative to have a lawyer who understands the current requirements for misconduct. The employee is not seeking or accepting suitable work – If an employee is not searching for a new job or has refused suitable work, you can challenge their continued unemployment benefits. 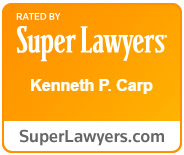 Missouri lawyer Kenneth P. Carp has over 2 decades of experience practicing law and has the skill and experience required to bring your unemployment benefits matter to the best outcome possible. In addition to helping resolve active disputes, Mr. Carp also works closely with employers in order to develop policies and other internal processes that can help minimize your unemployment insurance tax liability. As a former operations manager at Frito-Law, Mr. Carp also has relevant personal experience with many of the issues that employers face in regard to unemployment law and benefits. To schedule a free consultation with Mr. Carp, call our office today at 636-947-3600.